Voltage optimisation is a term given to the controlled reduction in the voltage received by your consumer unit to reduce energy use and power demand . While some voltage 'optimisation' devices have a fixed voltage adjustment, others electronically regulate the voltage automatically. Voltage optimisation systems are typically installed in series with the mains electrical supply to a building, allowing all its electrical equipment to benefit from an optimised reduced voltage supply. 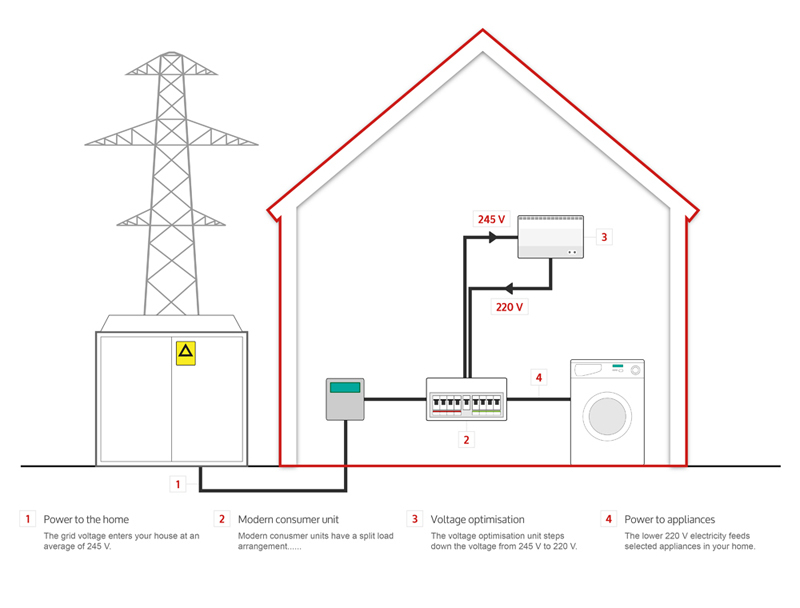 If you already have a solar installation or are about to have one installed, voltage optimisation offers excellent complementary benefits, as does the solariboost and immersun switch, the combination of these technologies is powerful, and something that we specialise in for customers throughout Wales who want to maximise savings. Fitting voltage optimisation or other renewable technologies, alongside your solar installation, will reduce your carbon footprint around the clock. Moving you closer to energy independence.